Nothing affects both the appearance and functionality of your kitchen the way cabinets do. How do you narrow down the tremendous selection of cabinets available today? Whether you’re considering a total kitchen remodel or you simply want to upgrade your cabinets, follow this guide to help you choose the best Houston cabinets to suit your needs and style. Who says cabinet doors have to be made of wood? Create a different look in your kitchen by installing glass doors on at least some of your upper cabinets. 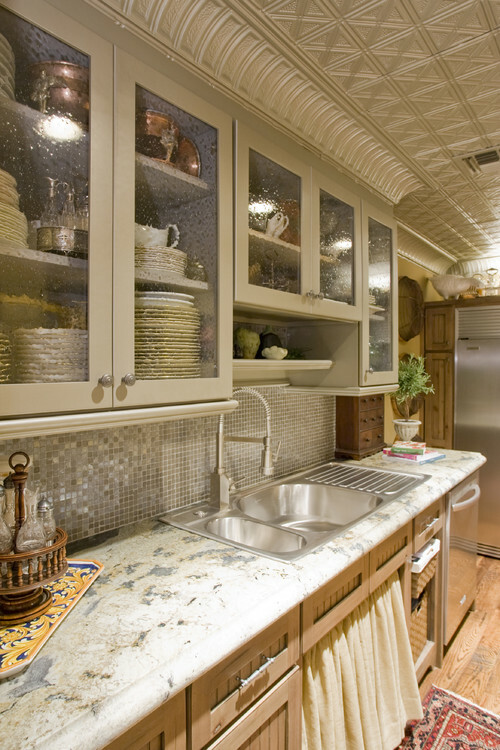 One major reason to choose glass-front cabinets is if you have specialty plates, crystal wine glasses or ceramic dishes you want to show off without taking up valuable counter space. Another reason is to allow light to pass through peninsula cabinets. These create a really spacious feel and give your kitchen a super elegant look. The added storage is practical, but if you have a peninsula in your kitchen, you may not like the way it closes off the space even if the glass cabinets allow light through for a more open feeling. Don’t forget the possibility of decorative glass if you prefer to obscure the appearance of the items you store inside the cabinet. Frosted, etched, stained and colored glass are a few decorative options to choose from. You can add colored dishes, vases, and knick-knacks to create some colored design elements without over-doing it on your cabinets. As a draw back, custom glass front cabinets DOES mean you have to keep organized. Whether you’re hoping to do your part for the environment by choosing eco-friendly building materials, or you want to clean up the air in your home, you have several attractive choices when it comes to cabinets for your kitchen remodel. First, there are these formaldehyde-free cabinets constructed without particleboard, fiberboard or plywood. These materials use adhesives that release fumes into your home. Bamboo plywood and agrifiber boards are formaldehyde-free for cleaner indoor air. Another eco-friendly option is to purchase wood cabinets certified by the Forest Stewardship Council (FSC). This ensures the wood comes from responsibly harvested forests. Similarly, you can seek salvaged wood from old projects and put it to good use instead of dooming it to the landfill. Finally, you can choose renewable materials such as lyptus or bamboo, as shown here. These species grow rapidly, yet they boast the same beneficial characteristics as hardwood, which usually takes decades to mature. Mix-and-match cabinets in Houston are a trend that will stay around for the foreseeable future. When done right, two- or even three-tone cabinets can enhance your kitchen greatly. 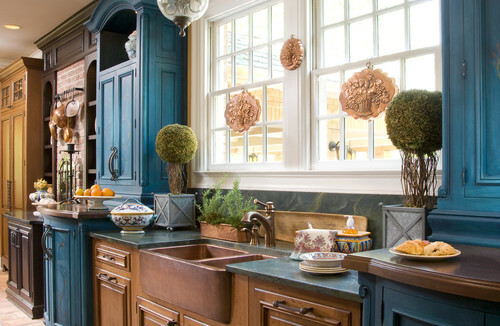 This kitchen would certainly still be beautiful even if all the cabinets were brown, but the peacock blue accents provide a sassy energy that breathes life into the kitchen. If you like the hutch-style cabinets shown here, dare to be bold by painting your own a different color than the surrounding cabinetry. Two-tone cabinets also serve to pull the wall color into the room. This provides continuity to the room and helps everything feel like it goes together without being an exact match. 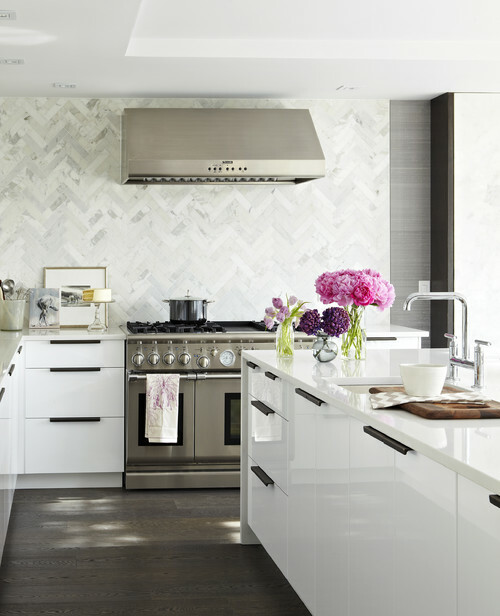 If you love a modern-style kitchen, there’s no better option than flat-panel cabinets. The clean lines have a minimalist appearance so common in today’s modern designs. Choosing the right hardware to go with your flat-panel cabinets is important for achieving the modern look you want. The tubular stainless steel bar-pulls shown here match the sharp geometric lines of the rest of the kitchen. Modern designs tend to combine with industrial materials. In this kitchen remodel, wood cabinets are nowhere to be found. In their place are flat-panel fiberboard cabinets with a white, high-gloss finish. Black tabs act as functional drawer-pulls and also provide a pop of contrasting color. Flat panels lend themselves to being painted a bright, bold color, which of course fits the modern theme perfectly. Choose a color you can live with for years to come so you don’t end up having to paint the cabinets again in just a few years. Even after narrowing down your selection to these five Houston cabinet options, you may still hesitate to select one over the other. For help making a decision that will stand the test of time, work with a full-service kitchen and cabinet design company. Together, you can create a cabinet arrangement to match your current kitchen or design a layout to go with the renovations you have in mind. Your final choice is sure to complement the space and suit your tastes. To learn more about having new cabinets designed and installed in your kitchen remodel, please contact Natural Stone Gallery today. The size and scope of your Houston kitchen remodeling project is up to you. Whether you plan to replace a single part of your kitchen or gut the entire thing, you should follow this guide and checklist to help everything go smoothly. Before you start your kitchen remodel, complete a few preliminary steps to get your project off on the right foot. First, measure the dimensions of your kitchen. Identify any walls you want to tear down to reduce foot traffic choke points and open up your kitchen. Keep in mind that some of these may be load-bearing walls, so you might not be able to remove them. Choose a budget that’s no more than 20% of your home’s current market value. If you intend to hire an interior designer, include the additional costs in your budget. Plan to use 80% of your budget, with 20% set aside for contingency expenses. Read online reviews and ratings. Make sure the contractor is licensed and insured. Get written estimates from three different companies. Rule out any low-ball prices that could result in nasty surprises later on. Ask contractors about their experience on projects similar to yours. Ask contractors for references you can contact to ask specific questions about reliability, cleanliness and overall job quality. Read the contract thoroughly before signing on the dotted line. It should include details about the project, the materials being used, brand names, start and finish dates, payment amounts and due dates, product warranties, and more. In general, the contractor shouldn’t ask for more than one-third of the project’s total cost as a down payment. Don’t make your final payment until the contractor has completed everything and you can see the job has been done correctly. If you plan to replace the kitchen cabinets in your Houston remodeling project, we’re here to help! Contact us for a free quote so you can get started transforming your dream kitchen into reality. You can learn what to expect from your Kitchen Remodel by checking out the houzz.com article, Kitchen Remodel Costs: 3 Budgets, 3 Kitchens. The kitchen is one of the most exciting rooms in your home to renovate, and the cabinets are a popular feature to upgrade. You can expect your remodeling project to make you happy for years to come and provide a high return on investment – as long as you make the right decisions. To take a little pressure off, follow this Houston buyer’s guide to selecting custom cabinets for your home. Stock cabinets are mass produced and usually available the same day or within a few days of ordering. Sizes, colors and designs are limited, but the price is right if you’re on a tight budget. Semi-custom cabinets are made to order based on standard sizes and styles. This added flexibility makes it easier to design cabinets to fit your specific needs. Just keep in mind that delivery takes longer because these cabinets are built after you order them. They’re also more expensive than stock cabinets. Custom cabinets are the most flexible, high-end cabinets you can purchase. They accommodate special requests and work in oddly sized or irregularly shaped spaces in your kitchen. Starting from scratch, a custom cabinet maker can construct just about anything you need. While prices vary widely depending on the size, materials and other options, you can expect custom cabinets to cost more than stock and semi-custom cabinets. Cabinet doors shouldn’t vary much between price levels. Look for doors with solid wood frames surrounding a solid wood or plywood panel, as opposed to a medium-density fiberboard or veneered particle board panel. Drawers must be well built because they get a lot of use over the years. They should be made of solid wood with dovetail joinery. A plywood drawer bottom should fit grooves on all four sides. Avoid particle board drawers that are simply stapled together. Hardware affects the life of your kitchen cabinets. Drawers should feature full-extension glides rather than having an integrated side rail or under-mounted double roller. Choose the “soft close” feature if you want to stop drawers from slamming shut. Door hinges, knobs and pulls change the aesthetics of your kitchen and make drawers and cabinets easier to open. Make a selection based on your personal preference. Shelves should be three-quarter-inch plywood. Thinner particle board shelves tend to sag under the weight of heavy dishes and cookware. To ensure you get everything you want and more from your Houston kitchen remodeling project, be sure to select your cabinet installer carefully. You can count us to provide sound advice and help you make the best cabinet upgrade for your needs and budget. Our quality custom cabinets are sure to add beauty and functionality to your kitchen for many years to come. Contact us for a free quote today so you can get started making your dream kitchen a reality! A kitchen design remodel is one of the most exciting changes you can make in your home. With so many designs to choose from, you may need a little inspiration to help you transform your kitchen. Consider the unique features of the best kitchen designs on the web. Your kitchen design should adapt to your life; your life should never adapt to your kitchen! These 10 designs bring kitchens to the highlights of life. How often do you forget about the items stored in the back of deep cabinets? Pull-out shelves make sure you can reach everything with ease. By remodeling your kitchen so every cabinet has this feature, you’ll find that organizing and storing things in your kitchen becomes much easier! This shaker-inspired contemporary space is a beauty to behold! The design is also highly functional. The island features drawers and cabinets on all sides for 360-degrees storage in addition to the shelving behind the island that serves both as a great eyepiece as well was functional storage. The over-island lighting and under-cabinet lights near the sink make this kitchen a joy to work in, day or night and adds depth the design. Natural lighting floods in creating a great reflection on the granite surface of the island. Natural stone is used in the tile, counter for the island, and even the granite counter top around the sink. Storage is the key to success in this kitchen. For a bonus, consider an island cook top to make cooking in this kitchen a joy. With the Houston heat, this room is sure to add a cool touch to the home in addition to being easy to clean and light. Remodeling your kitchen can be inspired by any number of things; but one of the most common reasons people remodel is to help make more space for their life. Instead of a breakfast nook, consider this kitchen design, which allows your family to enjoy one anothers’ company around the island. The unique round design makes the eating area more intimate and brings dining into the kitchen for space saving convenience. Another alternative to the traditional breakfast nook, the rounded granite countertop allows even more people to sit and eat right in the kitchen. This built-in nook is the perfect way to bring diners and food preparers together in the kitchen, saving the formal dining room for when guests are over. When you’re remodeling, make sure to consider your lifestyle. If you’re one to entertain often, consider adding something like the curved bar to accomodate your gifts and make that Friday night cocktail or dinner date much more social. Whether you’re relaxing on Galveston beach or you’re entertaining in downtown Houston, the custom granite counters in this design are perfect for any home. Custom closets don’t need to stay in the bedroom; a custom pantry can completely transform the function in any kitchen. Walk-in pantries are easier to keep organized when they feature adjustable shelves, pull-out wicker baskets and vertical slots, as seen in this kitchen design. Even if you only have space for a reach-in pantry, installing shelves on the back of the door is a great way to maximize storage space. You spend a lot of time in your Kitchen, put that time to good use by staying organized and amplifying every ounce of space. On top of adding value to your home, a custom pantry can add value to your life. The one shown here does a great job of maximizing storage space while maintaining a luxury / high-end feel with the marble counter top to the left. Pantry’s are a great alternative for people who aren’t a fan of having a ton of cabinets and are often preferred because you can visibly see everything you need to get to without going cabinet to cabinet. If you’re thinking of remodeling your kitchen island, remember: it can be used for more than just storing cookware and utensils. With this unique kitchen design, wine bottles and cookbooks also have a home. A second sink also makes food prep and cleanup easier, especially when multiple chefs are sharing the kitchen. As with most of the designs in this piece, the storage really makes this kitchen pop, and for those of us that love to entertain, having a solid island is one of the most important aspects to our Houston Kitchen Remodel.